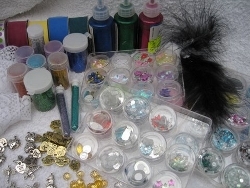 Twinkling gemstones that sparkle and gleam are very special effects to add to your creations. I think I must have been a Magpie at some time as I simply love adding in all the shiny, sparkly things to my cards and getting that look that is so "Girly"
These lovely embellishments come in all shapes, sizes and colours and can be used in a multitude of ways. Use them to make a centre for some of your flowers, or even make a complete bouquet out of a few flower shaped ones grouped together. 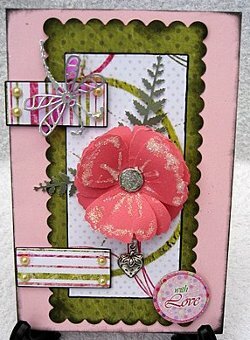 Put them round an image to accentuate it or make a border around the edges of your card. Lay them out on your card first, to see the effect, before you glue them down. This is by far the easiest way to get the effect before anything is added on a more permanent basis. And if you don't like the effect then you can shuffle them around until you do. You will need a strong glue to to stick them in place. I use a glue pen to stick small ones onto my card. Both jewels and glitters have been used on this card. The petals are sprinkled with holographic glitter and the centre of the flower is a brad. Even the Dragonfly wings have been sparkled up for a wonderful effect. Keep any small, empty pots for your jewels, to keep them safe. I keep some small moisturiser jars, washed, dried and ready to put them in. You can then keep all the colours separate, that way you will be able to find the one you need quickly. Don't be afraid to try different things. They really are cheap enough to play around with. Enjoy the magic that these tiny additions can perform!